Corryong, a rural town in north-east Victoria, is 15 km from the Murray River and about twice that distance from the boundary of the Kosciusko National Park. It is on the Murray Valley Highway and is the main town in the Victorian part of the Upper Murray district. Albury and Wodonga are 90 km to the west. 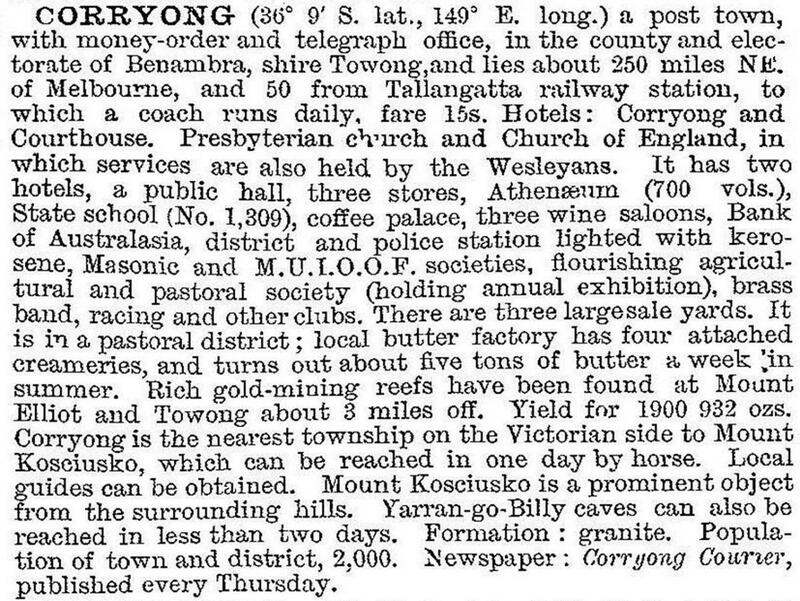 Corryong was named after the Kuriong pastoral run, taken up in 1839 by a pastoralist from New South Wales. It is thought that the name was derived from Aboriginal expressions referring to red body painting clay or a possum skin garment. Corryong is situated in a wide valley watered by the Corryong Creek, which is joined by the Thougla Creek east of the township. Farm selections began in about 1867 and settlement was sufficiently numerous for a school to be opened in 1872. In 1875 and 1876 a store and a hotel were constructed, transported from gold settlements which were in decline. In 1879 the township was surveyed. The first of several public buildings, an athenaeum, was built in 1882. Corryong was the main town centre of the Upper Murray, overshadowed only by Tallangatta which was the administrative centre of the shire council. In 1920 that was rectified by the Corryong Riding being severed and made the Upper Murray Shire. Reticulated town water began in 1924. Corryong’s importance was enlarged with a bush nursing hospital (1902-12), which was re-established more soundly in 1913, and the raising of the school to higher elementary level, also in 1913. Its main deficiency was the absence of a railway connection, and when the difficulty of the terrain was surmounted in 1921 the railway terminated at Cudgewa. Corryong’s population steadily increased until the 1960s. In that decade it also gained a Catholic convent and school, a swimming pool and its first Man from Snowy River Festival (1963). Corryong claims to have the remains of the principal claimant to the inspiration for Banjo Patterson’s poem The Man from Snowy River. He was Jack Riley, whose gravestone in the Corryong is inscribed: 'In memory of the Man from Snowy River, Jack Riley; buried here 16 July, 1914'. In 1962 the Walwa dairy factory was merged with the Corryong factory, when soldier settler farmers had acquired dairy herds and the factory had about 400 suppliers. By 1970, however, farmers had turned to beef cattle grazing. Only 117 suppliers were left, and some of them had small herds and were approaching retirement. The Cudgewa Dairy Cooperative Company (Corryong) was taken over by Murray Goulburn in 1973. Dairy operations were transferred to Murray Goulburn’s Kiewa plant in the 2000s. Corryong was a shopping centre, two hotels, a hospital, a Catholic primary school, a State P-12 college (317 pupils, 2014), five churches and a public hall. There are golf, bowls, tennis and swimming facilities. The High Country Carnival is held each March and a folk festival is held at nearby Nariel Creek each January. Accommodation is provided at two motels and two caravan parks (the larger one 7 km west of the town). The Man from Snowy River museum at Corryong and a visitor information centre are open daily. There was a proposal to construct an open-cute molybdenum mine at Mount Unicorn near Corryong. At the 2011 census Anglican and Uniting churches adherents were 39.6% of the town’s population which expressed a religious affiliation (Victoria, 17%). In Corryong and environs the combined figure was slightly higher, 41.5%.